Special thanks to our trombone section, featured in "Shoutin' Liza Trombone." Special thanks to our featured soloist: Justin Peckner, euphonium. 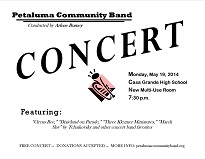 Special thanks to our featured guests: the Tomales High School Pan Band, directed by Ms. Tami Pallingston. Featured steel pan soloist, Joe Perea. The band dedicated this concert to SGM Stephen Chipman of the California National Guard, currently on active duty in Afghanistan. We want him and his family to know that there is a community that cares and a band that is playing for him. Listen to MP3 excerpts from our concert! Song Without Words, "I'll Love My Love"
* This concert is dedicated to Staff Sergeant Steven Newcomb and members of the 1140th Engineer Battalion, Missouri National Guard, on extended active duty in Iraq. With appreciation for their dedication to service, and a great deal of concern for their well-being, we want them and their families to know that there is a community that cares and a band that is playing for them. You can hear excerpts from our performance if you have (free) RealAudio software. Files range from 0.3 to 1.1 MB, so set your player to "stream," and listen while you download. 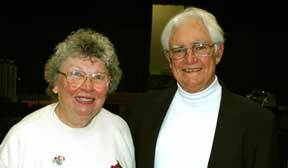 Jim Reynolds, left, and Arlene Burney, right, make it possible, and make it happen. Very special thanks for this concert go to Dr. Brian S. Wilson. He composed the beautiful "Orange" piece which expanded our horizons, he guest-conducted with patience and good humor, he played any instrument that we asked him to, AND he took these photographs. Thank you, Brian, Ruth and Jerry. March "Folk Songs from Somerset"